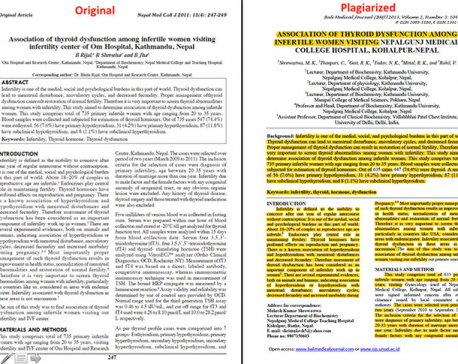 KATHMANDU, Oct 12: A team of six doctors has been found plagiarizing the findings of research carried out by another team of three doctors, thereby violating the Copyrights Act. 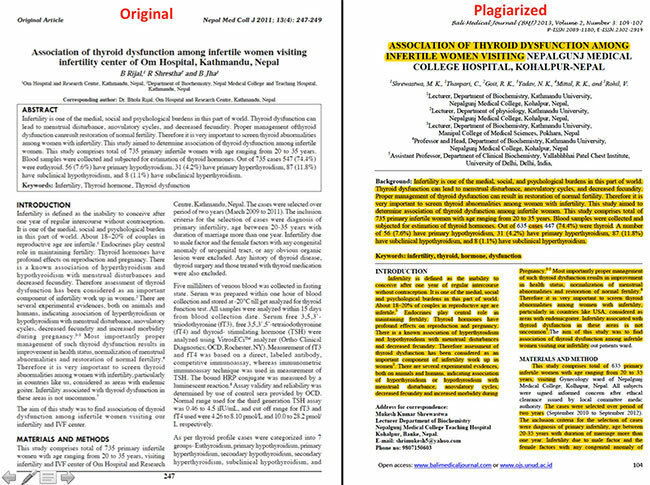 A research paper titled 'Association of Thyroid Dysfunction Among Infertile Women Visiting Infertility Center of Om Hospital, Kathmandu, Nepal', which was authored by Dr Bhola Rijal, Dr R Shrestha and Dr Bharat Jha, has copied and presented under the title 'Association of Thyroid Dysfunction Among Infertile Women Visiting Nepalgunj Medical College Hospital, Kohalpur, Nepal' as jointly authored by Dr Mukesh Kumar Shrewastawa, Dr C Thanpari, Dr RK Goit, Dr NK Yadav, Dr RK Mittal and Dr V Rohil. Of these six, Dr Shrewastawa, Dr Thanpari, Dr Goit, and Dr Mittal are associated with Kathmandu University and Nepalgunj Medical College while Dr Yadav is associated with Kathmandu University and Manipal College of Medical Sciences, Pokhara. 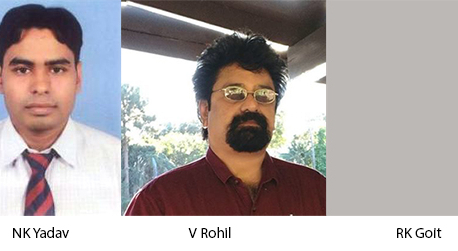 Dr Rohil was associated in his capacity as assistant professor at the Department of Clinical Biochemistry, Vallabhbhai Patel Chest Institute, University of Delhi, India. The paper on the research work coordinated by corresponding author Dr Rijal was published in the Nepal Medical College Journal in 2011, while the plagiarized version was published in the Bali Medical Journal of Indonesia in 2013. The second paper has copied A to Z the research abstract and all the contents of the first, using the same figures, language and bibliography. A comparison between the documents received by Republica shows that every line and figure and even the language structure are the same. Dr Rijal expressed dismay when asked about their research paper being copied by a team at Nepalgunj Medical College. “I am unaware of that research paper,” he said. “I don't know that we have authorized the publication of our research work under their names,” he said. His fellow team member Dr Jha was shocked to hear that their research finding was copied and presented as original work. One of the coauthors of the original paper, Dr. Rojeet Shrestha, Associate professor at Washington University of Barbados, says that "scientists work for the society to advance the well being of humankind and it is imperative that the people in this community use any research data honestly." He further says that falsification and fabrication of data are not tolerable. According to Clause 26 (1) of the Copyrights Act 2006, a fine of Rs 10,000 to Rs 100,000 or six month imprisonment or both can be slapped for violating copyright. Expressing his regret over the matter, Dr Shrewastawa, the corresponding author for the research team at Nepalgunj Medical College, said the mistake was theirs. “But we did not do it intentionally. We didn't know that similar research had already been published. It was just coincidence. We beg pardon for it,” Dr Shrewastawa said. “We emailed the editor of the Bali-based journal today, requesting a retraction of our research paper,” he claimed. Dr Dilip Sharma, registrar at Nepal Medical Council, said that researchers should take permission from the Nepal Health Research Council (NHRC) to carry out studies into such issues. Dr Anjani Kumar Jha, chairperson of NHRC, said that complaints should be lodged at the journal concerned, pointing out the plagiarism. “In this case, one research paper was published in a domestic journal and another in an international one. So we cannot take action over plagiarized contents,” said Dr Jha. “A complaint should be made to the Bali journal,” he added. KATHMANDU, Nov 29: Kathmandu University (KU) is all set to take action soon against doctors who were found involved in plagiarism.